Today’s meeting centered around our Flag and Feats of Skill. Following along in our Wolf Handbook, we covered the Achievements 2a the Pledge of Allegiance and what it means, 2c-how to properly care for and respect the flag. We also participated in an outdoor flag ceremony 2f and next week Mr. Regits will show us how to properly fold the Flag, 2g. We will also talk a little about our Pennsylvania Flag and how it is displayed, 2d, at our 3rd meeting and that will leave only one more requirement under Achievement 2, which is 2c, to lead our den in a flag ceremony, and that will be covered in a future meeting as well. Then we switched gears and worked on our feats of skill 1a-Catch, 1b- Balance, and different kind of “Rolls”- 1c-1e forward roll, back roll and forward falling roll and finally, we measured how high we can jump-1f. Sorry if we got a little dirty tonight, but hopefully we will all sleep well. I encourage you all to get your Wolf handbook at the Scout Shop if you have not done so already and make sure you go over at home Acheivemnt 8b-c, How to Protect Your Child From Abuse which you can sign off on page 26 when it is complete. 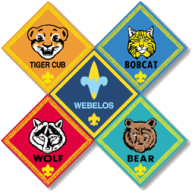 Even if your Scout already has their Bobcat badge, the fundamentals listed there are that upon what Cub Scouts are based and they are worth a review at home as well as here. Lastly, next week we are discussing health and hygiene. Please begin the chart we are sending home and bring back to the next two den meetings so we can do a before and after comparison of ourselves after next week’s meeting.